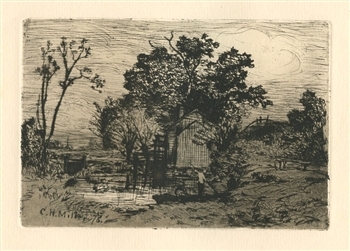 Charles Henry Miller original etching "Old Mill at Valley Stream"
Medium: original etching. This bucolic landscape is located in what is now the borough of Queens in New York City. This impression on laid paper was printed in 1880 for The American Art Review. The plate measures 5 1/2 x 9 inches; the sheet size is 8 x 11 1/2 inches. Signed in the plate (not by hand).